I can't believe how fast time has flown by since Thanksgiving. I'm leaving for Austin tomorrow. There are a lot of people I was hoping to touch base with before I left. I guess that will have to wait until after I get back. I guess that's what happens when you take long holidays. I'll be in Austin for over two weeks. That's a nice long time. I'm looking forward to just hanging out with my family, and knitting. We'll probably go see a movie, I'll probably go shopping with my sister, we might go out to eat once or twice, we'll talk a lot, but that's probably about as exciting as it's going to get. I can't wait. I've been giving thought to what projects I'll be taking with me. I think I'm going to try the Koigu shawl again--I'll be there long enough this time that there will be times when I can really concentrate on it. I'm also going to bring the sweater I started while I was down there for Thanksgiving. I haven't worked on it here at all--I was saving it for my return trip because it's such a simple pattern. Of course I'll be taking some sock yarn. I always start socks when I'm there, and this last time I even finished them within a week, which is outrageously fast for me and socks. It's the Ilga's Socks pattern from the Spring 2001 Interweave Knits. I sent away for the kit, but Jamieson's will work just beautifully. I'm still not thrilled with the fair isle, but I'll keep going on them. I'm still trying to decide whether to take these with me or not. 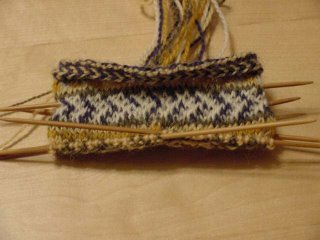 Once I finish the fair isle, it's just a basic sock. And I don't want this to sit around for another few years. I'm going to be posting from Austin so I won't say goodbye, or happy holidays, just yet . . .